I’ve been wanting to make up this pattern for a long time! And with the three-day weekend, what a better time to start than that? 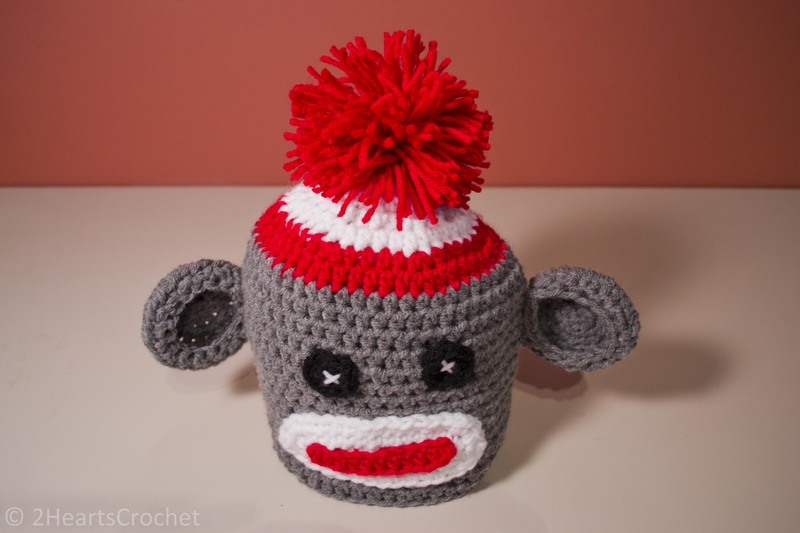 This sock monkey hat is too cute and super easy to make. I’ve included sizes infant thru adult, but the one pictured was made following the 6-12 month pattern below. Enjoy! Rnd 1) In white, make a magic circle. Ch 2. Make 8 hdc inside the circle. Join to beginning of the round and ch 2. Rnd 2) 2 hdc in each st around. Join and ch 2. Rnd 3) *2 hdc in first st, 1 hdc in next st* – repeat around. Change to red, join and ch 2. Rnd 4) In red, *2 hdc in first st, 1 hdc in each of the next 2 sts* – repeat around. Join and ch 2. Rnd 5) *2 hdc in first st, 1 hdc in each of the next 3 sts* – repeat around. Change to gray, join and ch 2. Rnd 6-15) In gray, 1 hdc in each st around. Join and ch 2. Rnd 16) 1 sl st (loosely) in each st around. Join and fasten off. Weave in ends. Rnd 3) *2 hdc in first st, 1 hdc in next st* – repeat around. Join and ch 2. Rnd 4) *2 hdc in first st, 1 hdc in each of the next 2 sts* – repeat around. Change to red, join and ch 2. Rnd 5) In red, *2 hdc in first st, 1 hdc in each of the next 3 sts* – repeat around. Join and ch 2. Rnd 6) *2 hdc in first st, 1 hdc in each of the next 4 sts* – repeat around. Change to gray, join and ch 2. Rnd 7-18) In gray, 1 hdc in each st around. Join and ch 2. Rnd 19) 1 stl st (loosely) in each st around. Join and fasten off. Weave in ends. Rnd 4) *2 hdc in first st, 1 hdc in each of the next 2 sts* – repeat around. Join and ch 2. Rnd 5) *2 hdc in first st, 1 hdc in each of the next 3 sts* – repeat around. Change to red, join and ch 2. Rnd 6) In red, *2 hdc in first st, 1 hdc in each of the next 4 sts* – repeat around. Join and ch 2. Rnd 7) *2 hdc in first st, 1 hdc in each of the next 5 sts* – repeat four times. For the remainder of the round, make 1 hdc in each of the remaining sts. Change to gray, join and ch 2. Rnd 8-20) In gray, 1 hdc in each st around. Join and ch 2. Rnd 21) 1 sl st (loosely) in each st around. Join and fasten off. Weave in ends. Rnd 7) *2 hdc in first st, 1 hdc in each of the next 5 sts* – repeat around. Change to gray, join and ch 2. Rnd 8-21) In gray, 1 hdc in each st around. Join and ch 2. Rnd 22) 1 sl st (loosely) in each st around. Join and fasten off. Weave in ends. Rnd 5) *2 hdc in first st, 1 hdc in each of the next 3 sts* – repeat around. Join and ch 2. Rnd 6) *2 hdc in first st, 1 hdc in each of the next 4 sts* – repeat around. Change to red, join and ch 2. Rnd 7) In red, *2 hdc in first st, 1 hdc in each of the next 5 sts* – repeat around. Join and ch 2. Rnd 8) *2 hdc in first st, 1 hdc in each of the next 6 sts* – repeat three times. For the remainder of the round, work 1 hdc into each of the remaining sts. Change to gray, join and ch 2. Rnd 9-21) In gray, 1 hdc in each st around. Join and ch 2. Rnd 8) *2 hdc in first st, 1 hdc in each of the next 6 sts* – repeat seven times. For the remainder of the round, work 1 hdc into each of the remaining sts. Change to gray, join and ch 2. Rnd 7) *2 hdc in first st, 1 hdc in each of the next 5 sts* – repeat around. Change to red, join and ch 2. Rnd 8) In red, *2 hdc in first st, 1 hdc in each of the next 6 sts* – repeat around. Join and ch 2. Rnd 9) *2 hdc in first st, 1 hdc in each of the next 7 sts* – repeat two times. For the remainder of the round, work 1 hdc into each of the remaining sts. Change to gray, join and ch 2. Rnd 10-23) In gray, 1 hdc in each st around. Join and ch 2. Rnd 24) 1 sl st (loosely) in each st around. Join and fasten off. Weave in ends. Rnd 6) *2 hdc in first st, 1 hdc in each of the next 4 sts* – repeat around. Join and ch 2. Rnd 9) *2 hdc in first st, 1 hdc in each of the next 7 sts* – repeat six times. For the remainder of the round, work 1 hdc into each of the remaining sts. Change to gray, join and ch 2. Rnd 10-24) In gray, 1 hdc in each st around. Join and ch 2. Rnd 25) 1 sl st (loosely) in each st around. Join and fasten off. Weave in ends. Rnd 7) *2 hdc in first st, 1 hdc in each of the next 5 sts* – repeat around. Join and ch 2. Rnd 8) *2 hdc in first st, 1 hdc in each of the next 6 sts* – repeat around. Change to red, joi and ch 2. Rnd 9) In red, *2 hdc in first st, 1 hdc in each of the next 7 sts* – repeat around. Join and ch 2. Rnd 10) 2 hdc in first st, 1 hdc in each of the next 8 sts. Do not repeat. For the remainder of the round, work 1 hdc into each of the remaining sts. Change to gray, join and ch 2. Rnd 11-24) In gray, 1 hdc in each st around. Join and ch 2. Rnd 8) *2 hdc in first st, 1 hdc in each of the next 6 sts* – repeat around. Change to red, join and ch 2. Rnd 10) *2 hdc in first st, 1 hdc in each of the next 8 sts* – repeat five times. For the remainder of the round, work 1 hdc into each of the remaining sts. Change to gray, join and ch 2. Rnd 11-25) In gray, 1 hdc in each st around. Join and ch 2. Rnd 26) 1 sl st (loosely) in each st around. Join and fasten off. Weave in ends. 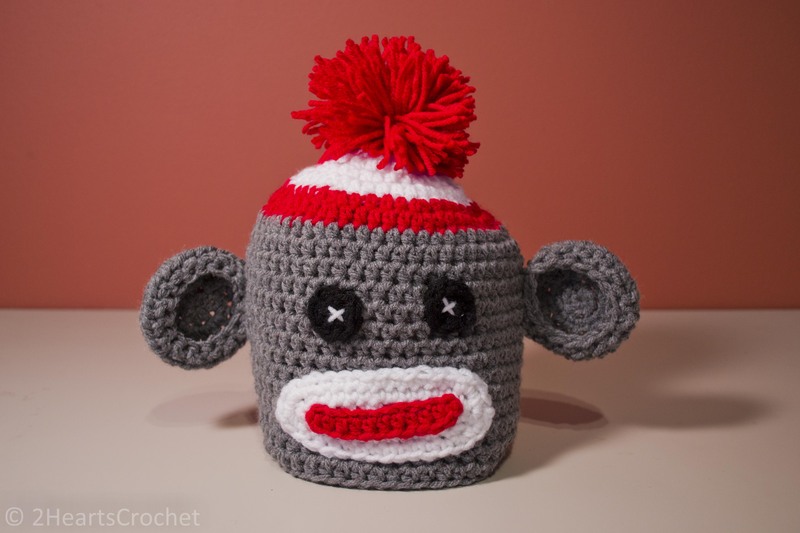 Move on to the eyes, ears, mouth and pom-pom for your sock monkey! Rnd 1) In white, ch 12. For the first half of the chain, starting in the 2nd chain space from the hook: 3 sc in first st, sc in each of the next 9 sts, 3 sc in next st. Working around the other side of the chain: sc in next 9 sts, join with sl st to beginning of the round. Ch 1. Rnd 2) 3 sc in first st, sc in next 11 sts, 3 sc in next st, sc in next 11 sts. Join and ch 1. Rnd 3) 3 sc in first 2 sts, sc in next 11 sts, 3 sc in next 3 sts, sc in next 11 sts, 3 sc in last st. Join and fasten off. In red, ch 12. Starting in the 2nd chain space from hook, hdc across. Fasten off. Sew to the white piece. Sew the entire mouth to the hat. See photos for placement if needed. Rnd 1) In gray, make a magic circle. Ch 2. Make 8 hdc inside the circle. Join to beginning of the round and ch 2. Rnd 4) *2 hdc in first st, 1 hdc in next 2 sts* – repeat around. Join and ch 1. Rnd 5) *sc2tg* – repeat around. Join and fasten off. Rnd 1) In black, make a magic circle. Ch 2. Make 8 hdc inside the circle. Join to the beginning of the round and fasten off, leaving a long tail. 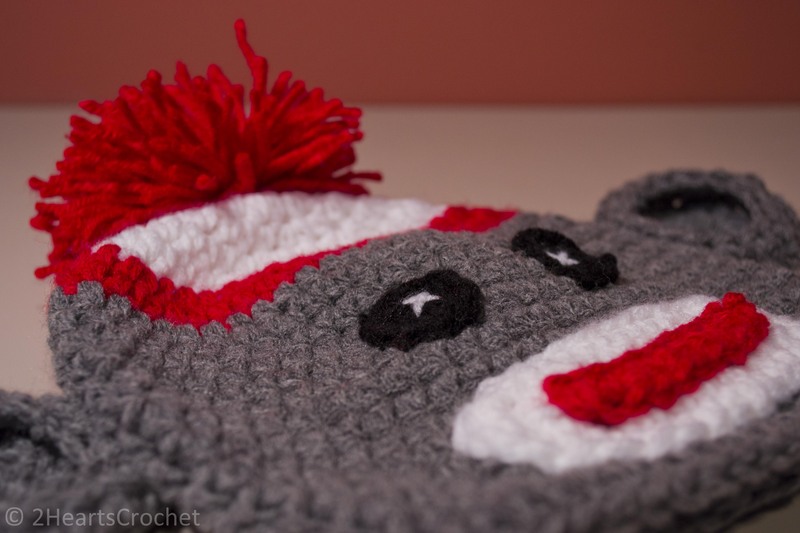 Use a tapestry needle to sew the eyes onto the hat. 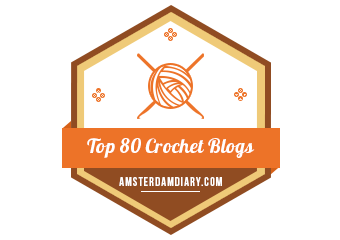 With a strand of white yarn, use a tapestry needle to make a couple of stitches in the center of the eyes in the shape of an “x”. Weave in ends. 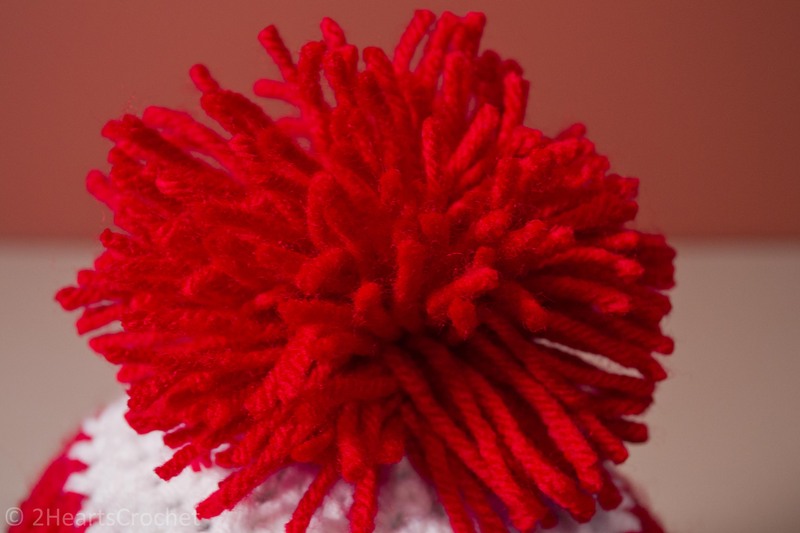 In red yarn, make a medium-sized pom-pom and attach it to the top of the hat. If you don’t know how to make a pom-pom, pop on over to Handimania and check out their fantastic pom-pom tutorial! Pretty easy! 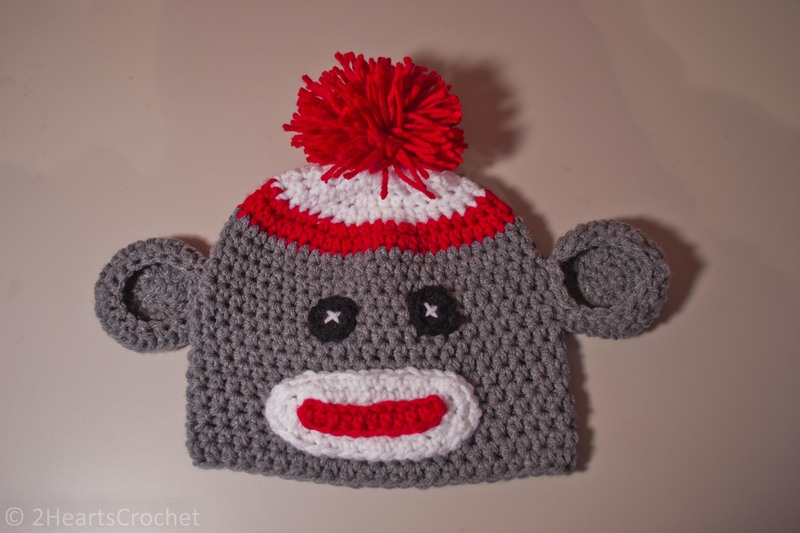 I would love to make some of these in different colors–I recently saw a sock monkey with lime green accents! How neat! 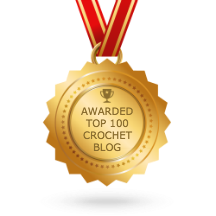 If you make one, please feel free to share by leaving a photo in a comment!